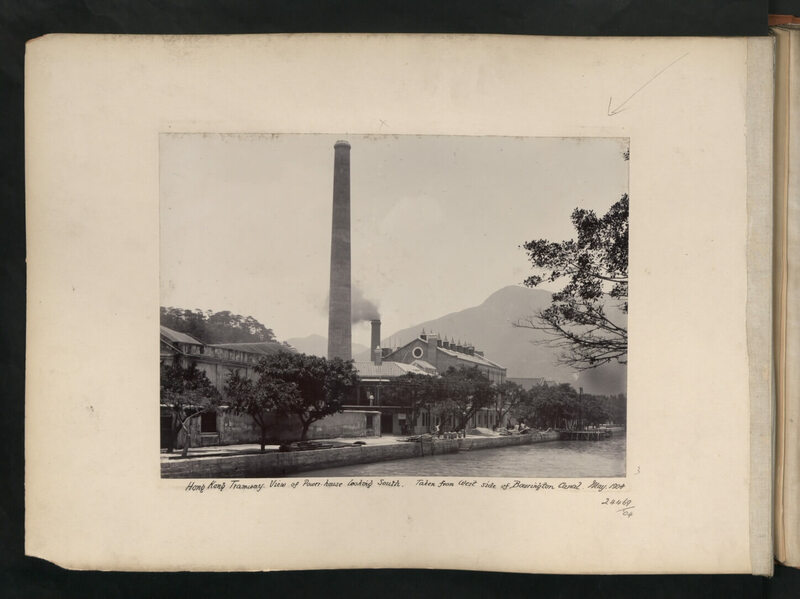 Paul Onslow has sent these photographs of the Hong Kong Tramways’ generating station situated by the banks of the Bowrington Canal in Wanchai. They are from the UK National Archives collection of the Hong Kong colonial office 1869-1910. There is no restriction / copyright issue. 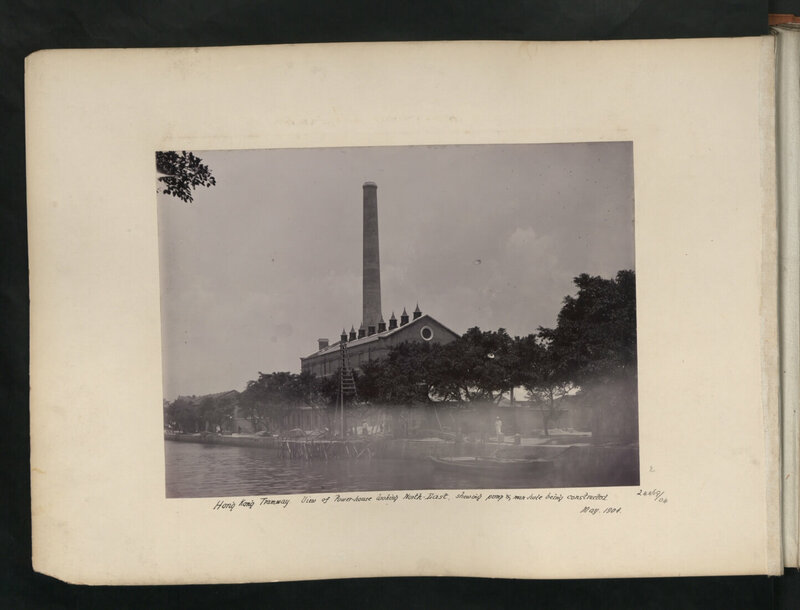 The first shows a “View of the Power-house looking South taken from the West side of the Canal” May 1904. 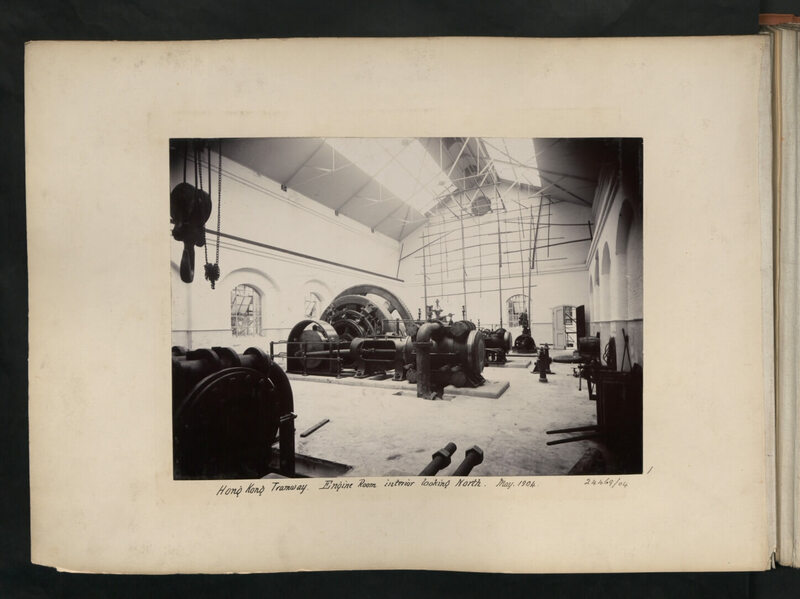 This one shows a “View of the Power-house looking North-East showing pump & manhole being constructed”. May 1904. 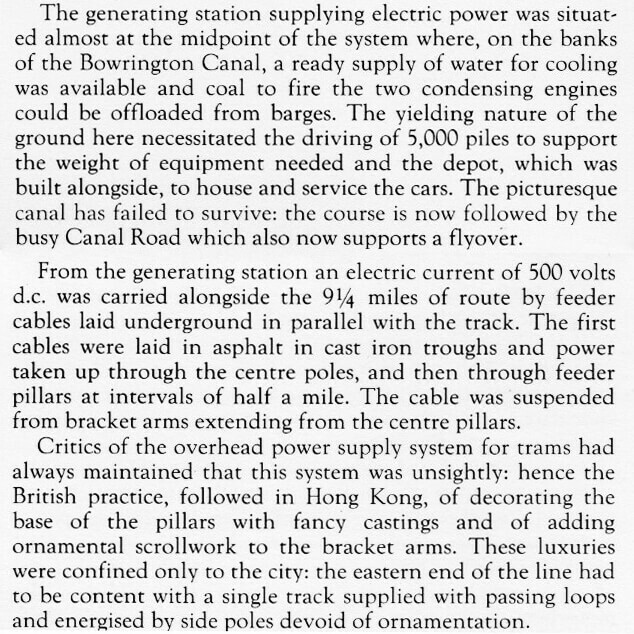 IDJ has sent the following report about the Hong Kong Tramways’ Bowrington Canal generating station which was at about the mid point of the tram system. HF: The report tells us the canal provided water and that coal to fire the condensing engines was brought in along the waterway by barges and offloaded. It also explains how the electricity was fed into the system. And concludes with details of complaints about the ugliness of the power pillars resulting in the “British practice… of decorating the base of the pillars with fancy castings and of adding ornamental scrollwork to the bracket arms.” Though only in “the city” presumably meaning Victoria. HF: Before urban development, the area was the estuary of the Wong Nai Chung river, which flowed through Happy Valley. The 4th Governor of Hong Kong, John Bowring (1854-1859), developed the estuary area and this development became known as Bowrington. This included Bowrington Canal fed by the Wong Nai Chung. Because the long and narrow canal resembled the neck of a goose it was known as Ngo Keng Kan (鵝頸澗, literally, goose neck stream). It was used by small vessels that could pass under various bridges along the route. 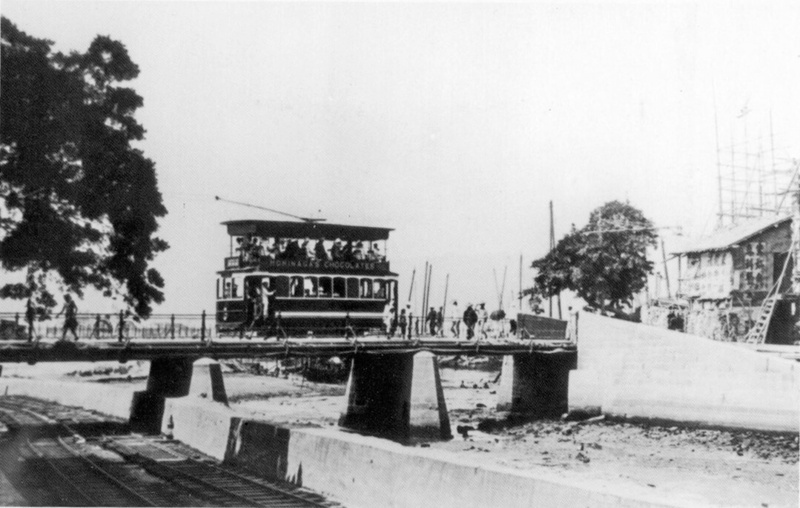 The landmark Bowrington Bridge across the canal, built in 1861, was known as Ngo Keng Kiu (鵝頸橋, goose neck bridge) and as shown above carried the Hong Kong Tramways line across the waterway. IDJ says the image above clearly shows the temporary narrow gauge railway tracks laid under the bridge for the East Praya reclamation. Only man-handled trucks could get under the bridge. At high tides the railway was submerged and so stopping reclamation works traffic. And the following image shows again the narrow gauge railway laid under the bridge for the reclamation. This time looking north towards the harbour. Is that one of the “unsightly” power pillars on the right, the narrow triangular shape? It looks the right height. 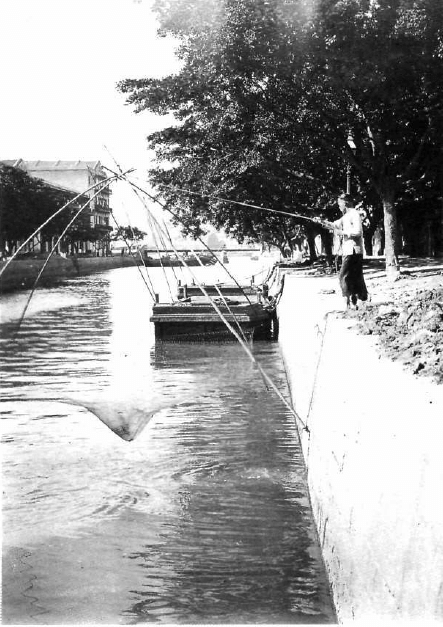 The canal was finally covered and the bridge removed during the reclamation from 1922 to 1929 that created modern Wanchai. Contemporary Canal Road East, Canal Road West and the Canal Road Flyover are located above the canal. The flyover is in Wanchai District but effectively separates Wanchai from Causeway Bay. 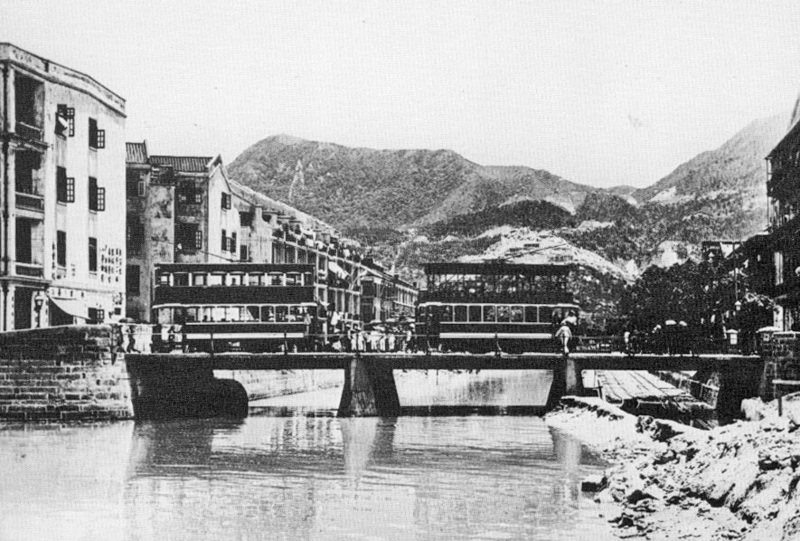 The image below of the canal c1905, comes from A collection of rare photographs of early Civil Engineering Projects in Hong Kong by C Michael Guilford who credits it to the HK Museum of History, provisional Urban Council. Apparently this area is still known as Ngo Keng.